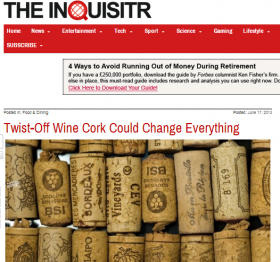 One of the biggest boons to the wine industry has been that once the cork came out, there was no putting it back in, forcing wine drinkers to either drink the whole bottle in one sitting or get creative and find something else to stop up the bottle.Thanks to a recent invention, corkscrews may soon be a thing of the past. No longer will we need a separate kitchen utensil to break into our beverage or jerry-rig a way to stop up the bottle. Twist-off wine corks (Helix corks) have been designed to not only be easier to take out of the bottle but also make it possible to put them back in. Using almost a reverse of the style that most pop bottles use to cap off the beverage and save it for later, Helix corks use a “threaded” design on the cork and the bottle itself, making the removal and replacement of the cork much easier as the parts just slide together on grooves. Cork manufacturer Amorim and bottle-making company O-I worked together to create this ingenious new design in wine-stopping technology. It took four years of research to ensure perfection of the design, but be assured that the time was taken to ensure that the redesign of the cork would not impact the taste, aroma, or color. The Helix cork is made of harder stuff, meaning that it won’t expand or shrink as much. Where previous corks required the presence of gas interaction to keep the bottle sealed, there is nowhere for the oxygen to go with the new twist-off cork. The Helix cork won’t change what you love about wine, but it will make it easier to remove and replace the cork. What do you think about twist-off wine corks? Would they change how you feel about wine?